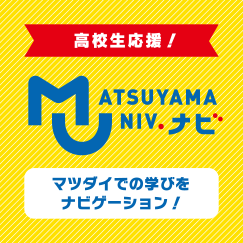 Thank you for visiting the official website of Matsuyama University. Matsuyama University got its start as the Matsuyama Higher School of Commerce in 1923. Thereafter, the school transitioned into the Matsuyama College of Economics and then the Matsuyama University of Commerce before becoming the Matsuyama University of today with five undergraduate faculties with six departments as well as five graduate school courses. Located in Bunkyo-cho, Matsuyama City, Ehime Prefecture, some six thousand students study here, and alumni total over 73 thousand, of which numerous members have flourished primarily in the business world as well as in education and civil service. 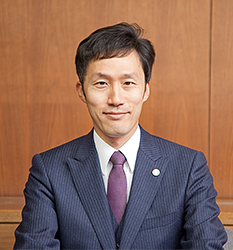 It is through the activity of these graduates in diverse fields that Matsuyama University has gained its traditional reputation as being a school whose alumni quickly gain employment. And what has supported these accomplishments is the founding spirit of the university. Since its establishment, Matsuyama University has proclaimed “Truthful,” “Faithful,” and “Useful” as its educational philosophy. “Truthful” and “Faithful” present the attitude one should have towards learning; “Useful” expresses the ideal of what one should be as a person. “Truthful” is an attitude of not being satisfied with existing knowledge and continuously learning and mastering things in pursuit of the Truthful. “Faithful” is an attitude of not just studying knowledge as information but rather engaging in learning while constantly bearing in mind faithful questions in order to harness the knowledge gained in one’s own life and work. “Useful” is an attitude of striving to face others, in interpersonal relations and in society, in good faith, proactively engaging with people, being modest, and respecting and sharing opinions in addition to maintaining ethical behavior. In short, this educational philosophy means that we must get to the “Truthful,” attain “Faithful” knowledge and skills, and be “Useful” people in order to be proper individuals for society. Matsuyama University sees these three founding principles as a foundation for both students and teachers, and is engaged in the development of extensive educational initiatives aimed at the creation of talented individuals who will be able to contribute to society. It does so by implementing a curriculum which is ahead of the times while also responding to the needs of the times, a curriculum which gives consideration to the cultivation of a comprehensive vision and in which students come in contact not only with specialized knowledge but also diverse ways of thinking through close communication with fellow students and teachers. It is my belief meaning of Matsuyama University and its mission is, through students’ studies here, to clarify their hopes, aim to realize those hopes, and provide a space where students can grow significantly as people. I intend to continue working and to do so even harder to ensure that this university continues to develop as a learning space in which current students and alumni can take pride.